Disney has announced that it expects to lose $200m (£126m) on its movie John Carter, making it one of the biggest flops in cinema history. 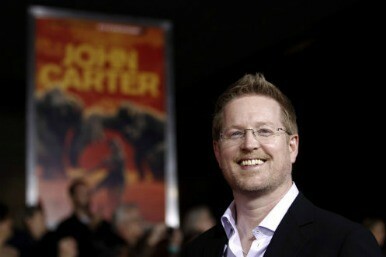 The film, directed by Andrew Stanton (pictured), is estimated to have cost about $250 million to produce, with a further $100 million spent on marketing, yet ticket sales stalled after a poor reception from critics. Disney said John Carter has brought in about $184 million in ticket sales worldwide so far, but these sales are split roughly in half with theater owners. The film, which is heavy with 3D effects, is about a Civil War veteran transported to Mars and is based on a series of books written by the late Edgar Rice Burroughs. John Carter could result in an $80-120m loss for Disney's movie business during the current quarter. Disney released the news after the markets closed yesterday and its shares fell 1% following the announcement. The film, starring Taylor Kitsch, received average reviews, with a 51% "Tomatometer" on the movie rating site Rottentomatoes.com and New York's Time Out magazine describing it as "deadly dull". Disney will be pinning recovery on the success of other big budget movies due for release later this year. These include The Avengers, due to be released in May, and Brave, set to be released by Disney Pixar in June. John Carter ranks with history's biggest box office disasters, although it is difficult to rank them accurately because of inflation and the reluctance of film companies to fully disclose loss details. But the Hollywood Reporter says that last year's biggest flop was Mars needs Moms, which cost $150m to make and only took $39m at the box office. Who is the highest-grossing actor ever? Does an Oscar boost movie takings?